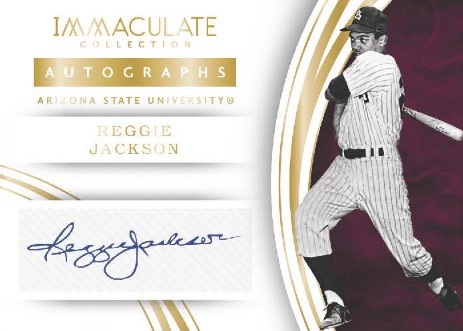 Continuing to roll out the high-end brand to individual sports across the NCAA landscape, 2016 Panini Immaculate Collegiate Baseball takes collectors to the early years for many star players. Consisting of either autographs or memorabilia cards, each hobby box yields five hits. 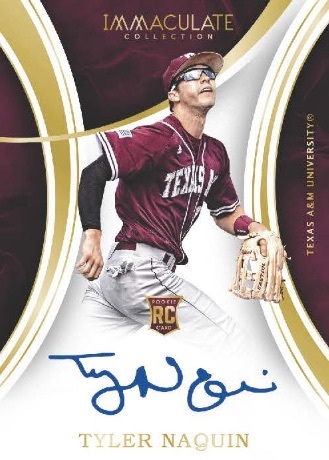 In addition to limited base and parallels, 2016 Panini Immaculate Collegiate Baseball swings for the fences with mostly on-card autographs. Among the choices are Rookie Autographs and Premium Patches Autographs for top rookies. 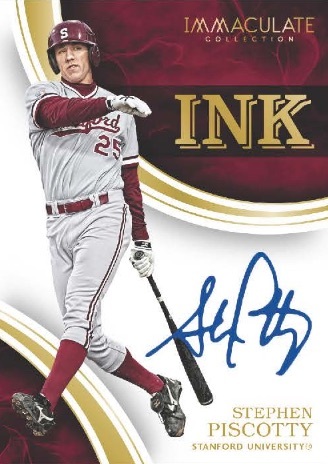 Also hard-signed, Immaculate Ink features the most notable players while Sports Variations brings the other two major sports into the set: basketball and football. 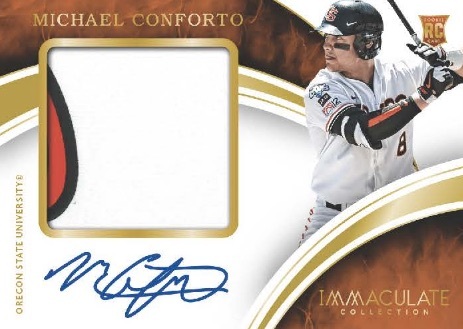 The main Autographs insert includes the all-time greats with a sticker signature. 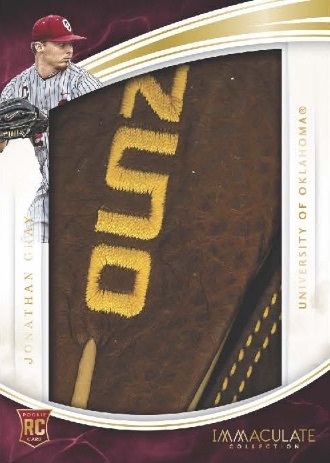 Coming with game-worn or player-worn memorabilia are several relic inserts in 2016 Panini Immaculate Collegiate Baseball. 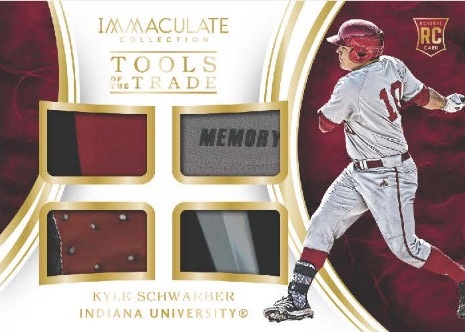 Immaculate Numbers Memorabilia features a small swatch and the player's number in the design. RPS Rookie Player Caps showcases jumbo hat pieces with limited Brand Logo, Button and Team Logo parallels. 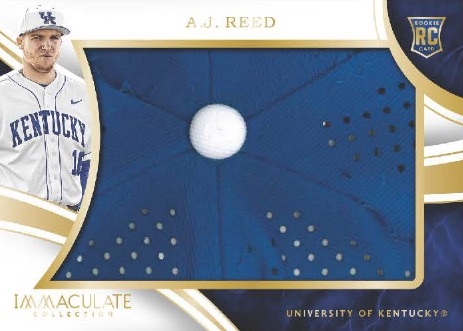 Going with a quad relic, Immaculate Tools of the Trade utilizes cleats, gloves, hats and jerseys to form a memorabilia assortment. Prime parallels are numbered to ten copies or less. Lastly, Immaculate Fielding Gloves (1/1) offers a large player-worn glove piece. 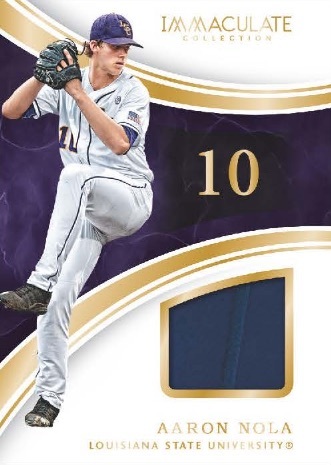 2016 Panini Immaculate Collegiate Baseball is exclusive to online case breakers. These are not final images. Contents and designs subject to change. 2016 Panini Immaculate Baseball Sealed Hobby Box NEW!